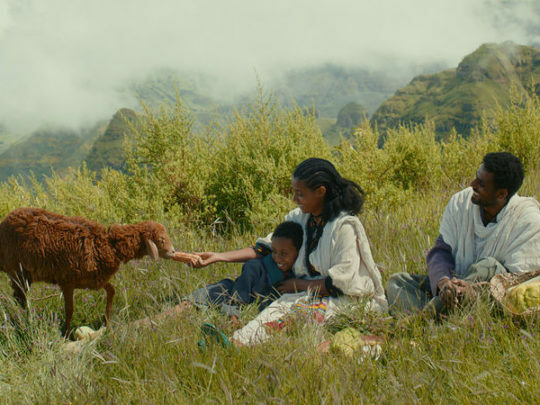 ‘Lamb‘ is Yared Zeleke’s love song to his homeland Ethiopia and, like any true love song, it is simultaneously grand, spontaneous, gentle, quite, ineffable, solidly grounding and simply exquisite. The protagonist Ephriam, is forced to leave his home as a child. Ephriam’s mother died from the drought and he travels with his father to meet relatives. His father leaves to find work in the city and promises to return when the rains come. This sudden loss of home and parents takes hold of him profoundly but he has one comfort, his lamb Chuni, the last link to his treasured past family life. Ethiopia is the only country in Africa that the Europeans never colonized. Zeleke also had to leave this home as a child. Ephriam and Chuni are like two peas in a pod and their friendship eases the trauma of displacement and brings comfort when Tsion, a headstrong, education-thirsty young woman in the family refuses to speak to him and also when his uncle mocks him for cooking, which is traditionally a woman’s task. However, when his uncle announces that he will be sacrificing Chuni on the upcoming holiday, Ephriam is agonized and agitated. He embarks on a plan to save Chuni and return home. He decides that he will sell samosas in the market and earn enough money to buy the bus fare back home. He suffers several setbacks, including a gang of bullies in the market and soon the day of the sacrifice approaches. He manages to get someone to look after Chuni and he tells his uncle that the lamb was stolen. His uncle beats him but at least Chuni is safe. He eventually finds her a safer place with a young shepherdess and figures out how to deal with the bullies. He even becomes friend with Tsion. Eventually, Ephriam saves enough money and returns to the shepherdess to get Chuni. The lamb doesn’t want to leave with him. She has found a new home. The shepherdess tells him to let go. ‘Lamb’ is a coming of age story. It respectfully tells of the challenges of growing up as an outsider without parents and also in a multi-religious society; Jews, Christians and Muslims populate Ethiopia and Ephriam is part of the minority group of Felashas. Rediat Amare and Kidist Siyum who played the roles of Ephriam and Tsion were part of a casting process where Zeleke auditioned more than 6,500 people; more than half of them were children. They are both from poor families and Kidist lost her parents at a young age. Now, thanks to the efforts of the team behind Lamb, Rediat is going to a private school in Ehtiopia where he is funded until graduation. Kidist was seen by a famous director in Switzerland and he cast her as the star in his new film. Many other people in the film were from that village and had no experience with filming. Some of them had never seen a film before. It is probably this genuine naiveté that makes them so authentic and allows the audience to feel that they are inside of the film with these people. There was never even one hint of camera consciousness. 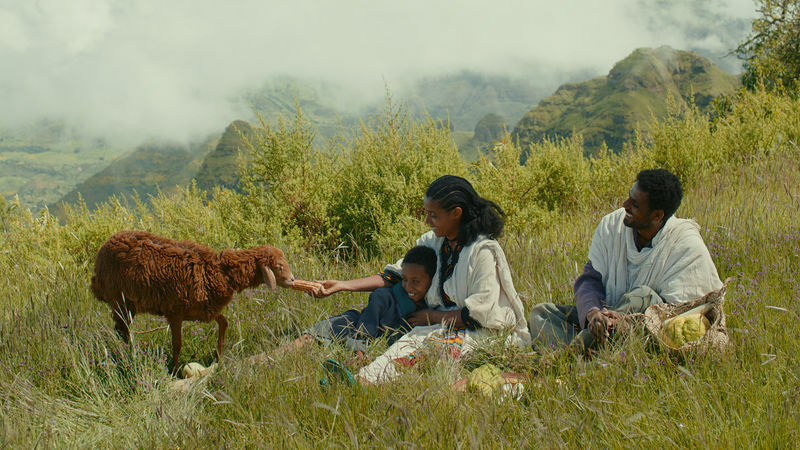 Ephriam is seen throughout the film in yellow galoshes and Zeleke commented that aside from being typical of a farming country, the colour is one which reflects his hope for the continent. Filming at 3,000 feet was no easy task however. According to Zeleke, the film took three months because of the need for preparation. The boundless landscape stood as its own character in the film. Leaning almost towards pathetic fallacy, the emotions of Ephriam echoed off the beautifully stoic mountains. Zeleke inspires one to wonder what sort of imprint those mountains would leave on a soul. Surely, through Lamb, we can attempt to understand the imprint it left on his. Lamb premiered in Cannes’ Un Certain Regard 2015. It was the first time an Ethiopian film has ever screened as an Official Selection at Cannes. Zeleke credit his grandmother for his storytelling abilities. Zeleke has also written, produced, directed and edited several short documentary and fiction films. He also worked with Joshua Atesh Litle on the award-winning documentary The Furious Force of Rhymes. Lamb is his first feature-length film.